Please scroll down to the bottom for English verison of tasting note. 手上有數款多納的樣本, 就選了兩款不同桶但同樣是十九年陳 1993 年的多納, 喝喝看有多大的分別. 那兩款酒聽聞都是供台灣市場為主的, 現在先來第一款. 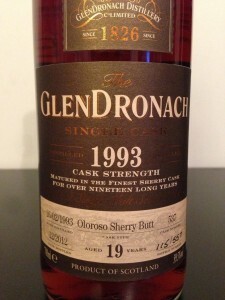 I have selected two GlenDronach samples from my stock. They were from different casks but same age. Heard that these two bottlings are for Taiwan market. Here is the first one. Comment: Rich on nose, sweet winter honey, followed by hot preserved ginger, even sweet toffee and finally balanced by herb and scorch. Full body, thick, rich, presisting sweetness。Medium length aftertaste, trend to scorch taste, clove but not hot, warm. Sweet as expected but not fat, balanced by ginger and spicy, heabal and roast favour adding complexity. A rich and powerful dram, though room for improvment in fusion of elements, it is definitly an outstanding whisky.